Q10. 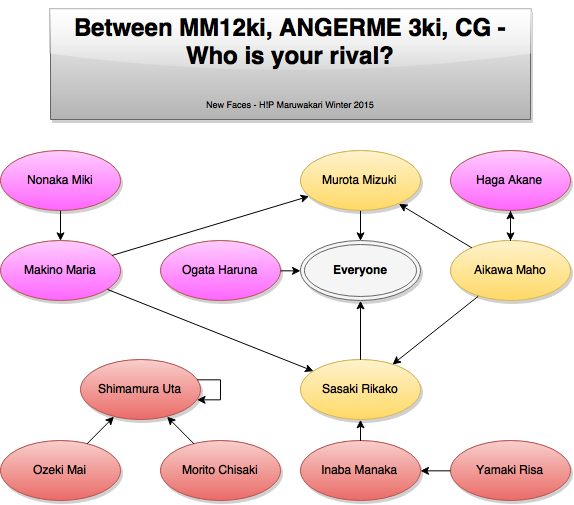 Between Morning Musume。12ki, ANGERME 3rd gen, and Country Girls, who is your rival? Ogata Haruna: Everyone. In order to not lose to the ones who came from the Kenshuusei, I'd like to absorb the good parts and do my best. Nonaka Miki: Makino Maria-chan. Although we're contemporaries, Maria-chan has a lot of experience as a Kenshuusei, so I'd like to learn from her example, while doing my best so that I don't lose. Haga Akane: Aikawa Maho-chan. She might have been my junior when we were Kenshuusei, but she's good at singing and dancing, so I can't let myself lose! Murota Mizuki: Everyone. Everyone's my rival! Aikawa Maho: Murota Mizuki-san's singing and dancing has impact, I'd like to be able to sing like Murota-san. Sasaki Rikako-san's dancing is huge and catches your eyes, so I'd like to be able to dance in a spirited way that won't lose to her! Haga Akane-san's the one I'm closest to from when we were Kenshuusei, and we reviewed our dancing together, so I don't want to lose to her. Sasaki Rikako: Everyone! Everyone's levels are high, so they're rivals. Yamaki Risa: Inaba Manaka-chan. Manaka-chan's dancing is good and her singing is cute, I think she's amazing. I'm definitely aware of it since we're in the same group, but I can't let myself lose! Inaba Manaka: Sasaki Rikako-san. Her dancing is really energetic and she's got a powerful presence, so I'd like to cultivate a 'friends but at the same time rivals in a good way' relationship. Morito Chisaki: Shimamura Uta-chan. I stil don't have that awareness that she's a rival, but because we're close in age and she's really cute, I think that I've got to do my best. Shimamura Uta: With my personality, I don't really mind others, so my rival is myself. I'd like to meet Ogata Haruna-chan and Nonaka Miki-chan who I auditioned together with. Ozeki Mai: Country Girls' Shimamura Uta-san! Within Country Girls, I'm closest with Uta-chan, but I think that it's because we're close that she's become my rival!